This is only very tangentially related to my work, but I wanted to share as widely as possible and my site is the way to do that. 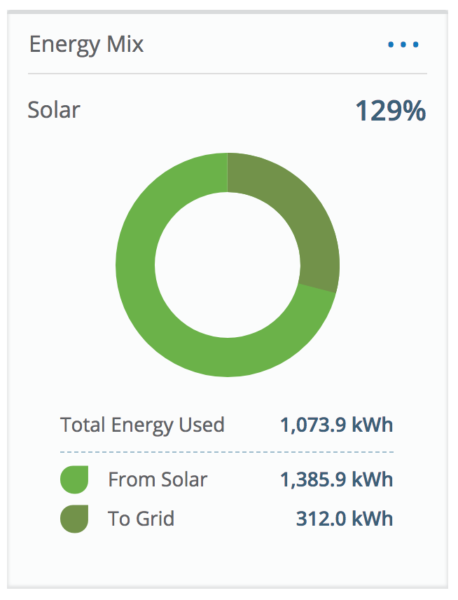 When we bought our house last August, we knew that solar power was a goal of ours in the long-term. In January, when the administration announced tariffs on solar panels would go into effect soon, I decided to start poking around to see the economics of it– I didn’t expect that we had the cash to get ahead of the tariffs, but it was worth the research. Photos all by my amazing husband, Tyler Finck. We reached out to 3 companies and got 2 quotes out of the process, and immediately realized that this was TOTALLY attainable in the now, not a few years down the road. I want to break down the economics of it, and I’m going to be super transparent here. First and foremost, the array we got installed is a 7.848 kW ground-mounted array. More on the tech stuff below, but two different companies both told us that this would be the ideal size to cover our total electricity usage safely with minimal over-production. We chose a ground-mounted array rather that roof-mounted because our roof didn’t really have the best real estate, maintenance costs for the roof increase with an array, and we have the land to make a ground-mount work very very well. 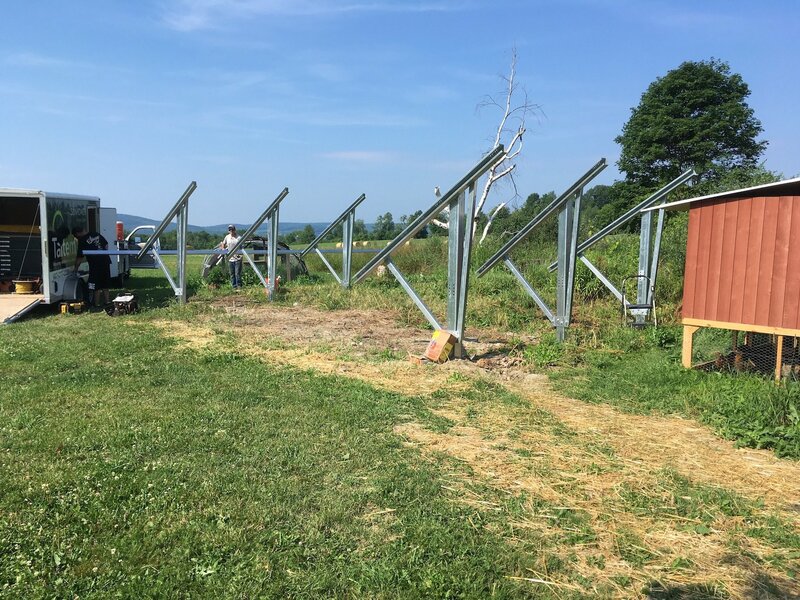 With that said, a ground-mounted array added a tiny bit to the price tag because of the mounting structure and the trenching to get the power from our panels to our home. We received a NYSERDA rebate, state tax credits*, and federal tax credits*. This makes our final cost less than half of the actual system cost. Our project cost breakdown is on the right. That final cost number still seemed huge, and inaccessible for our family as new homeowners. But we decided to do a little more math, and it started making sense with a low-interest solar loan. 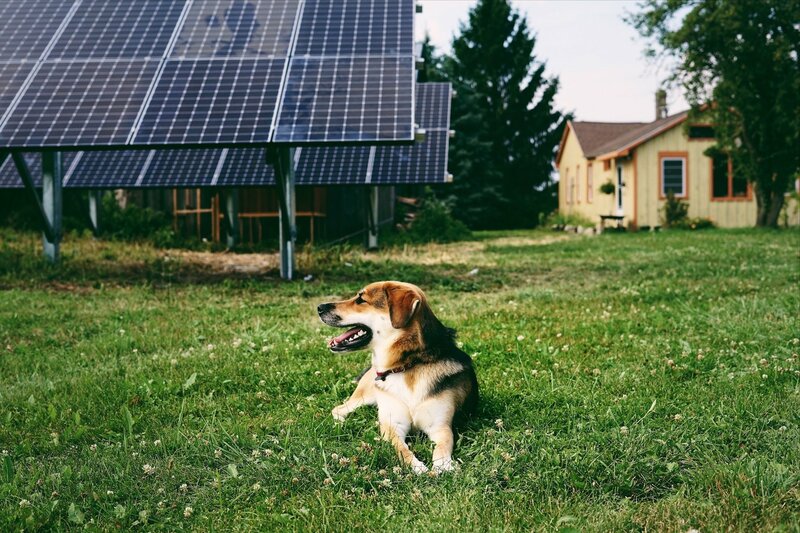 I’m sure there are other options too, but Alternatives offers competitive solar loans. 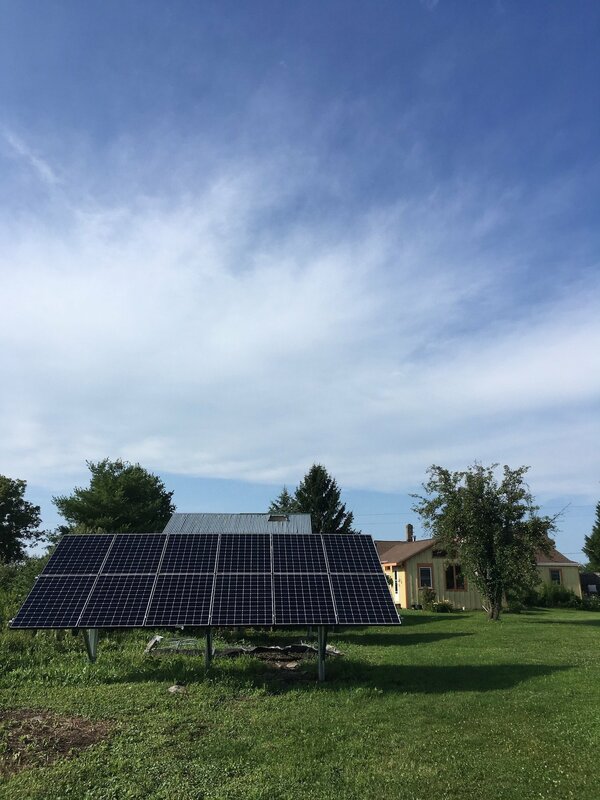 We put a little less than $1,000 down, and got a $12,000, 15 year solar loan at 4.9% (usually 5.49% but you can get a bump down with a coupon in the Local First Ithaca guide!). This makes our monthly payments $96– almost exactly what our monthly NYSEG bill was (almost always between $90 and $110.) But we don’t have to pay NYSEG for electricity anymore! Just a small monthly connection fee (we haven’t actually gotten a bill since the solar meter was installed but I think it’ll be $15). So the moral of the story on price: For the first 15 years of having solar, it will cost us only $15 more per month (the unavoidable NYSEG connection fee) than what we were paying NYSEG for fossil fuels. After that, we’ll be making electricity for free, and we pay $15 / month for the connection fee only**. *The tax credits are anticipated and based on your tax burden for the year. We haven’t officially gotten these credits yet, and won’t until filing time for 2018. We were lucky enough to cover this portion with a family loan, but there are low- (and I believe no-) interest loans to cover tax incentives like this whose applications go hand in hand with the solar loan apps. It’s something the banks are super used to handling. **I’m sure NYSEG will restructure these fees in the next 15 years, but this is our best guess based on now. We wound up choosing Taitem as our installer. Not only was their quote the lowest (and based on an actual survey of our property, usage data, and our specific wants and needs), but they gave us options for newer technology, and they were super friendly and helpful throughout the process. Their status as a B-Corp was an added bonus. From the three options they gave us, we chose SunPower’s high efficiency 327 watt AC modules, which come with a 25 year product, 25 year labor, and 25 year power warranty. The advantage of these over the 327 watt DC modules is that the inverters (what converts the power from DC to accessible AC) are integrated at the factory into each individual solar panel, and are therefore covered under the 25 year warranties. The older DC panels are daisy-chained together, then feed all of their DC power into an inverter, usually mounted in the basement, which is under separate (and lower) warranty coverage. My understanding is that because DC panels are daisy-chained to get their power to the single inverter, it means that if one panel goes out, the whole system is down. We decided to go for the AC panels, though $3,000 more on the total system cost, because of their reliability and durability, the warranty coverage, and the understanding that after the warranty expires, even if a few panels go out, our system will still function. So far, we’ve been SO happy with our system and its performance. Since we flipped the switch (start date July 26, 2018) we’ve produced 129% of the energy that we’ve consumed. My understanding is this excess that we’re creating in the summer months will cover the darker days and lower production of winter, resulting in a hopefully 100% efficient year. The monitoring system that we use is also amazing. It can show us big pictures stuff like our usage and production over time, but also nearly to-the-minute usage and production data. We’ve learned that our dryer, electric stove, and microwave are the biggest hogs of electricity, way more than our hot water heater or window AC units (which we try to only use on scorchers). We can see peaks at breakfast and dinner, and when we run the dryer. Our baseline of electricity usage, which includes a basement dehumidifier, the fridge, lights, etc., is pretty darn low. 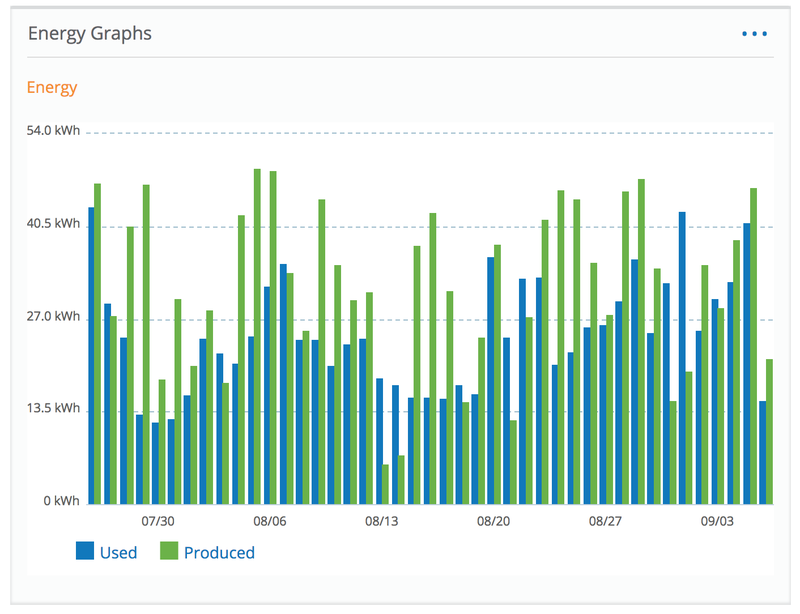 This is a graph of daily usage and production from the launch of our system. $250 in credit if you say we referred you!